Sunnyvale, CA, April 2nd, 2014— Vitria Technology, Inc., a leading provider of streaming analytics solutions, will discuss how customer-centric companies use streaming big data analytics to gain real-time insight into their customers’ behavior and issues, and proactively convert these insights into opportunities to delight them in real-time. Dr. Dale Skeen, Vitria’s co-founder and CTO, will detail customer scenarios and best practices at the Big Data Innovation Summit in Santa Clara on Wednesday, April 9th at 4:30 p.m.
“Streaming analytics is transforming the way businesses address time-sensitive threats and opportunities – by reducing the time to insight by 100x to1000x in comparison with batch-oriented Big Data Analytics. In my session, I will discuss how some of the most innovative companies are using streaming analytics to excel at real-time customer experience monitoring, engage in more targeted 1-to-1 marketing, and proactively detect and prevent fraud,” said Dr. Skeen. The Vitria product experts will also showcase the company’s innovations in streaming analytics through live demonstrations of the Vitria Operational Intelligence (OI) Apps at booth #205. 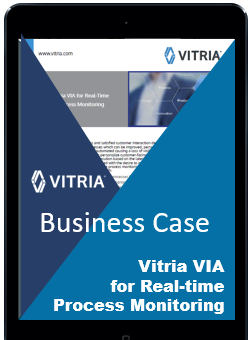 The latest Vitria OI Apps help enterprises uncover, analyze, and act on actual business activity patterns – in seconds and minutes. They help companies tackle online customer service issues, fraudulent financial transactions, delayed order fulfillment and shipments, supply chain challenges and track suspicious people of interest in real-time, before a customer or the broader organization is affected. Vitria will also be polling attendees at the Summit to assess interest levels as well as adoption of streaming big data analytics technologies within enterprises. Survey participants will receive a copy of the findings and automatically be entered in to a drawing for an iPad.